A rich potato side dish that's great with roasted or barbecued meats. It can be served either piping hot like a gratin or warm like a freshly made potato salad. Preheat oven to 180C. Halve the capsicums, remove the seeds and stalks, then place, cut side down, on a baking tray lined with non-stick paper. Peel and halve the shallots lengthways, then place, cut side up, on the tray around the peppers, sprinkle with salt and drizzle with oil. Bake for 35 minutes until the peppers start to blister on top and the shallots start to singe. Then put both in a mixing bowl, cover and leave to steam for 20 minutes. Peel and discard the skin from the peppers and keep the flesh with the shallots until ready to assemble. Boil the potatoes in a saucepan with salted water until tender then drain. Slice the chilli into rings, fry in the saucepan with some olive oil until tender, then scoop onto a plate to cool. Put the mascarpone, milk, cornflour, tarragon and garlic in the saucepan, whisk and bring to the boil then remove from the heat and season to taste. 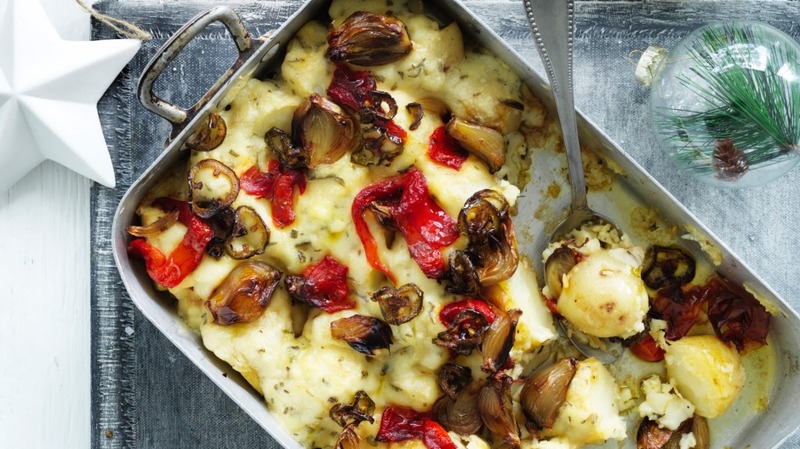 Halve the potatoes, place in an ovenproof dish then pour on the mascarpone cream. Half submerge the capsicums, shallots and chillies in the sauce. At this point it can be covered and kept chilled for 3 to 4 days. To serve, uncover and bake at 160C for 30-40 minutes until piping hot and bubbling.